Thoughts about the sculpture: Context is critical to these sculptures. The indoor and outdoor surroundings, as well as the relationship to other objects and to each other, are in constant flux. 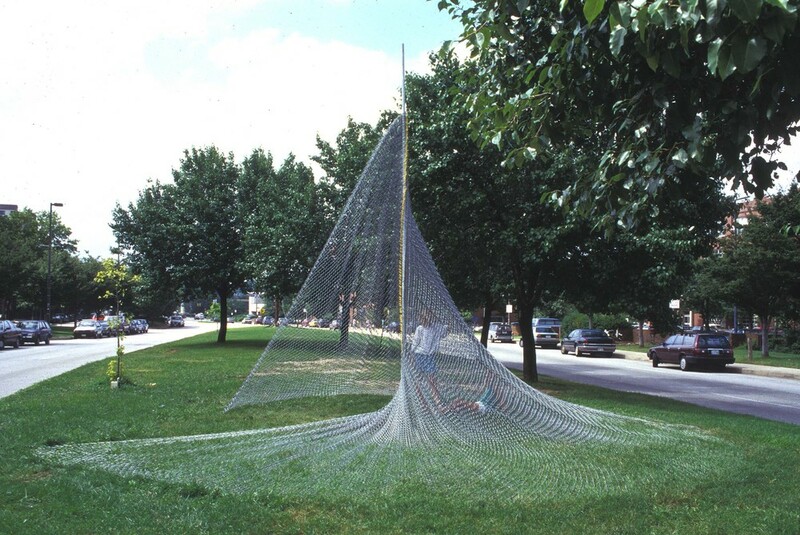 In an outdoor setting the sculptures act as a monitor to the surroundings; interacting with the context of the site (with each other ... if there are more than one form) and the various weather and light conditions. Indoors, whether alone or with other objects, a surreal environment is activated by the sculptures as the viewer navigates through the installation. Phenomenon is also a major concern in my work, making process an integral part of its content. The chain link fence pieces have evolved over the past several years, influenced by the urban context of my studio. 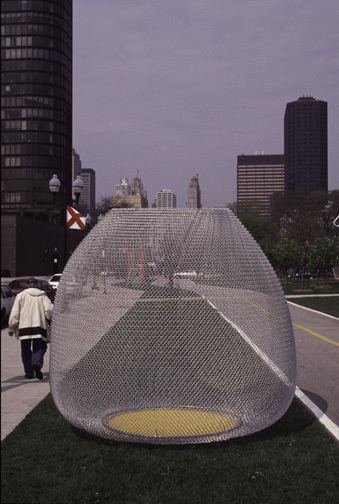 I have been working with the metal mesh/chain link fencing "fabric," exploring its complex characteristics. 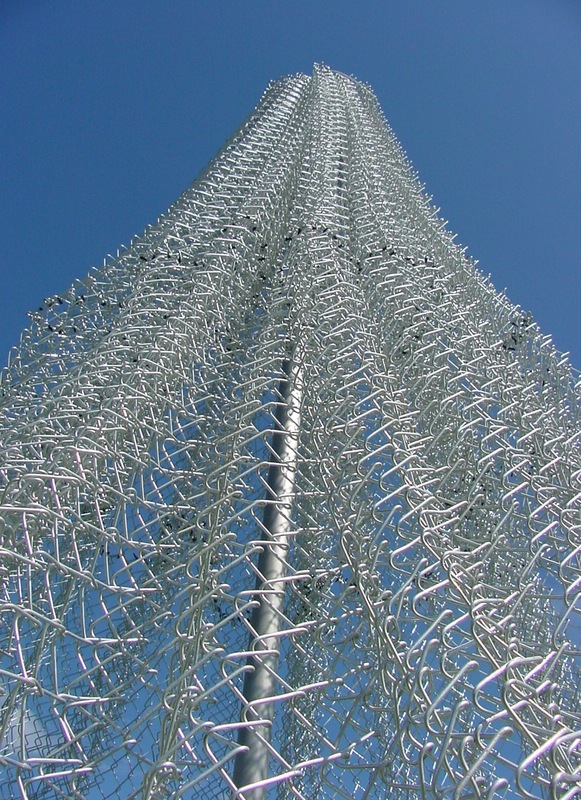 The shapes of the fence sculptures are determined by the structural characteristics mentioned above, stainless steel retention rings, zip ties, aircraft cable, and gravity. My approach to their construction is influenced by the structures and the objects produced by primary cultures. The structures and objects from primary cultures have a presence that goes beyond their utilitarian purpose and hold a power that is a result of the refinement of form and directness and understanding of materials used to make them. The shape of the fence pieces is determined by a combination of the structural characteristics of the fencing fabric, certain restrictions that I impose, and gravity. In the landscape the sculptures perform as monitors to the site. The available light is critical to the sculpture and performs as an agent, relating the sculpture to the site, and transcending its objectness to a more ethereal state. 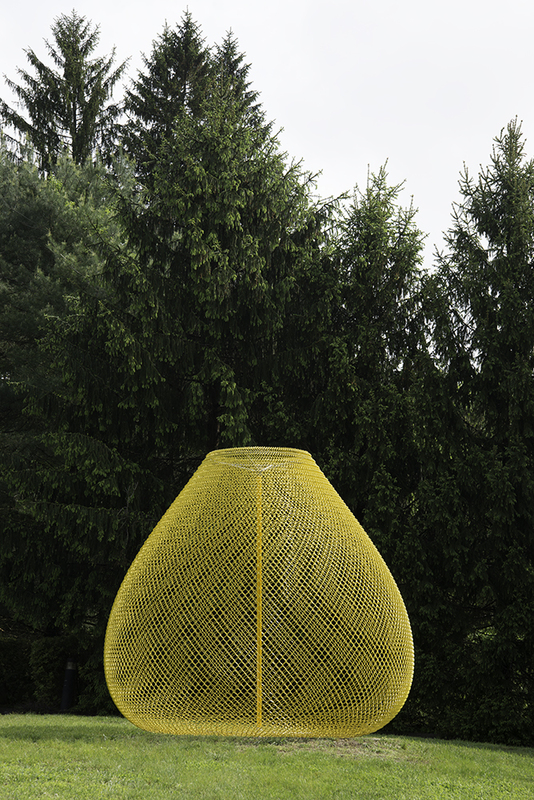 The sculpture’s presence differs depending on the quality of light, ranging from the time of day to the time of year. They are objects that bring to question grander forces beyond our comprehension. Quotes on the Chain-link Sculpture in reviews. 1. It can perform simultaneously as a membrane, as well as a structure. 2. It has a grain; in one direction it is rigid, yet in another, it will collapse on itself. 3. It is loose and malleable yet has great strength under tension. 4. It can be woven in a variety of metals, gauges and mesh sizes.